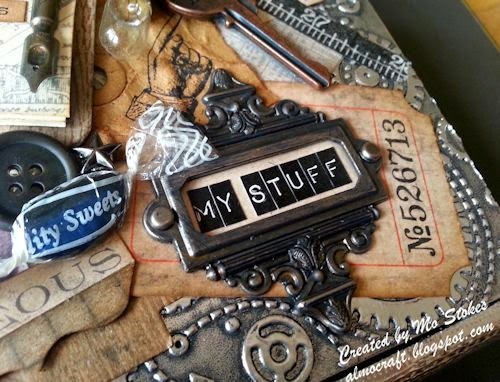 I started crafting when I was a young girl, I loved taking old packaging boxes, jam jars and empty sweet tins etc. and decorating them with old wallpaper and gems to store bits and pieces in. I took up dancing in my teenage years which was my main hobby for a long time, I picked up my crafting again to fill a void when I retired from dancing about 10 years ago. I live with my hubby Alan who is my biggest critic, but is also very supportive of everything I do. 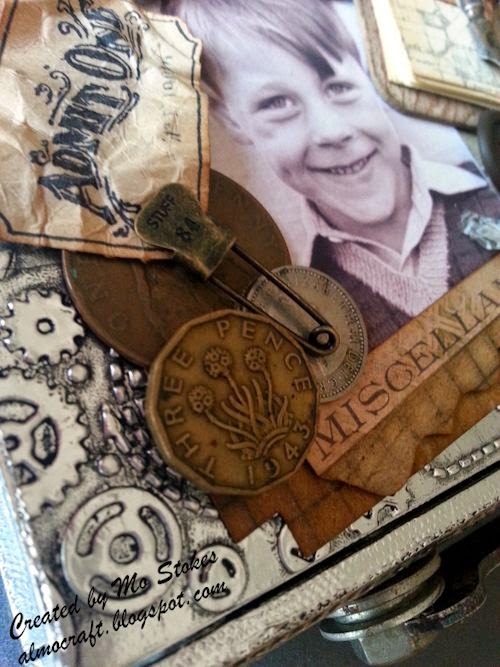 I have always admired work of Tim Holtz who I have had the honour of meeting twice now. My style tends to be Vintage/Shabby Chicand as I love all things botanical, animals, birds and the seaside these themes show up a lot in my work. I don't really plan my projects in advance, I just go with the flow and see where my imagination takes me. I cannot begin to tell you how happy I was to be asked by the amazingly talented team to be a Guest Designer for A Vintage Journey. When I looked at the standard of work from previous designers my first thought was how do I follow that! It was indeed a great honour to have been given the opportunity. I put my thinking cap on and thought about a project that would fit the theme for this months challenge hosted by the lovely Anne who chose 'All about Him'. 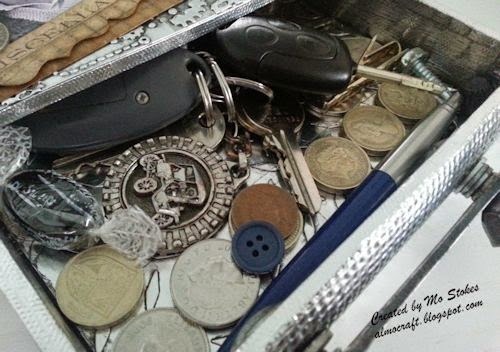 I looked at the untidy pile of bits and pieces, my hubby Alan creates on the table whilst emptying his pockets every evening and decided that I would make him a box for his stuff. The photograph on the box is one of my favourite childhood photo's of Alan, he was about 8 years old here. I have backed it onto Kraft resist papers cut with the cabinet die. 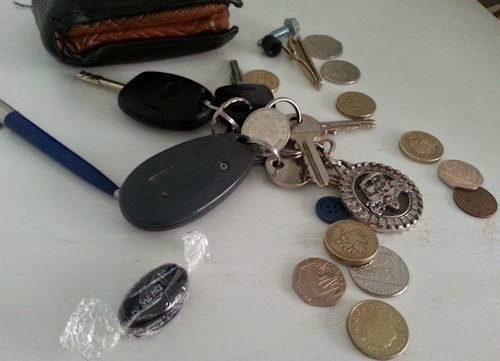 The old money on the bottom left is his, kept for a rainy day! the ideology pin has the wording stuff on it, and miscellaneous seemed to be a good word to describe what he collects, he is like a magpie! the admit one ticket stamped onto the back of an adage ticket is there because if we have been to a show or anywhere where you get admission tickets, he carries them around for months (I think its a man thing). The clock, cog & spinner represents his watch which also ends up on the pile set at 6pm the time generally gets in from work, I have added an ideaology buckle and an old button to the box because for some strange reason if they break off his shirt, belt or bag, he forgets to let me know so I can fix it, again he just carries them around. The notepad and pen is to represent the pen that he keeps in his pockets and the notes written on bits of paper. The little clip board is inked mount board stamped with the Tim's wood stamp from wallpaper and wood set, I have just cut a few sheets of cream paper down to size, inked the edges and stamped the top one using a stamp from the Warehouse District set and watering can archival. I finished it off with a pen nib, clip and a little chit chat sticker. The bike stamp I will explain later. The sweetie is a gem from old jewellery and the little star is a stud which broke off from somewhere and Alan picked it up!. On the bottom left we have Label letters in an Ornate frame and mounted on a journalling ticket. 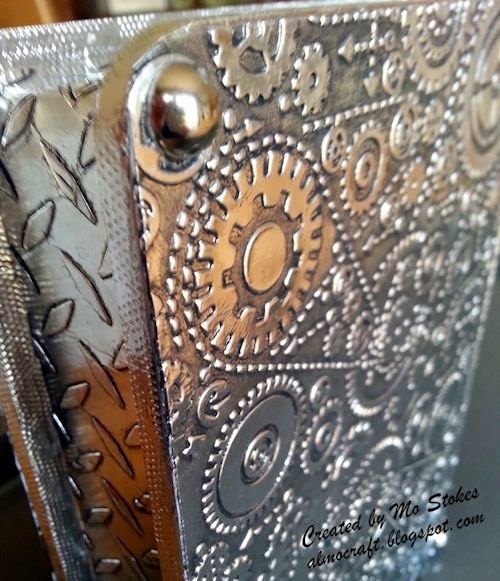 On the base and the sides of the box you can see the metal embossed patterns much better. The feet were something else he picked up, they were studs off an old belt he found and he thought I could use them for my crafting, so use them I have. The front of the drawer has builders shim under the foil, and I have got the pattern by running a ball tool over it. I did not have a handle that looked right, so I went hunting around in Alan's shed and found this old bike spanner and a couple of nuts and bolts. He used to ride his bike to work every day (thus the stamped bike I mentioned earlier on the top), he does not have it any more so the redundant spanner has found a new use. Inside the box I have just lined it with the metal, and again used an emboss folder for the base. Here you can see the pile of stuff that gets emptied out every night. The stuff all neat and tidy in its new box. 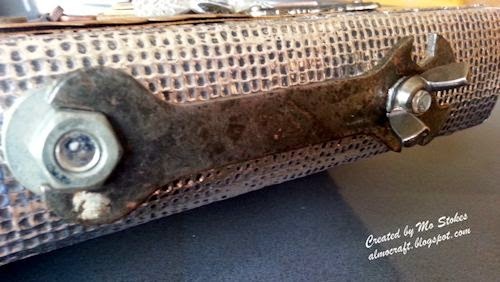 This is such an inspirational project Mo with some fabulous ideas - the shim underlay, the spanner handle - fantastic! (Dare we say, it's also such a practical solution to that irritating man thing, lol!) Thank you for supporting us and guesting with us today! CONGRATULATIONS to all of you, emails and badges are on their way! Thank you to EVERYONE who took part in this challenge, it was really hard to choose, and good luck for our current and future challenges. We have another fabulous guest post on Monday so please pop back and see us. Have a creative weekend all! Congratulations to all of you for sharing your lovely art with us! Hugs! Congratulations to Meggy May and to the (very worthy) Pinworthies, your creations were all superb! Mo this is a fabulous altered piece......and you have used such wonderful embellishments, it could not be more personal. Hats off to you Mo!!!! This is a superb piece of alteration and one of the best things I've ever seen you create. The embossing works a treat and I love the spanner handle. And then the fact that all of your carefully selected embellishments work so well together and have a meaning behind them is so special. A huge round of applause clever lady. Massive congratulations go out to Yvonne, Karen, Julia and Sue on your worthy wins too! Wow what a fabulous solution to the 'man thing' situation - I'm sure he will be proud to use this for keeping his treasures safe. Thanks too for the detailed description of the hows and whys - wonderful. What an absolutely brilliant creation, Mo - with so many amazing personal details. 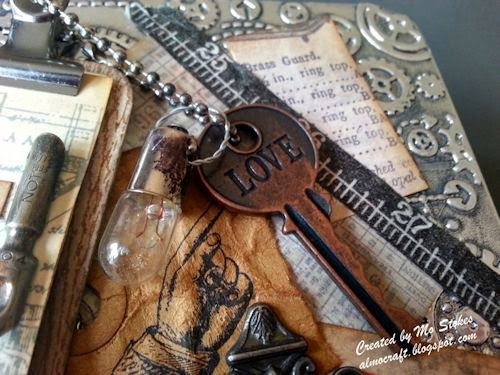 I love the mini-clipboard, and the light bulb and all of it with the special connection to your "him". Just wonderful! Huge congrats to Yvonne, and the Pinworthies, Karen, Julia and Sue! I agree with everyone above!! Mo your box is out of this world and I so loved reading about the meaning behind each little element! What an amazing piece!! You say he is your worst critic, but I bet he just must have loved this! Such a lovely photo too! Oh and such a great photo of you too and wonderful to find out a bit more about you! Big congrats to Yvonne and all the winners, fabulous creations from all of you!!! Love the details and the level of craftsmanship. And all the unique touches. Congrats to the winners as well. thanks as always for sharing. Fabulous! I like your composition on this box, it is very well balanced. I loved reading about the meaning of everything you used on it. Congrats to the winners, too. Huge Congratulations to Winners Yvonne, Karen, Julia and Sue all fabulous entries. THANK YOU everyone for your very kind comments on my metal box, I am quite touched. 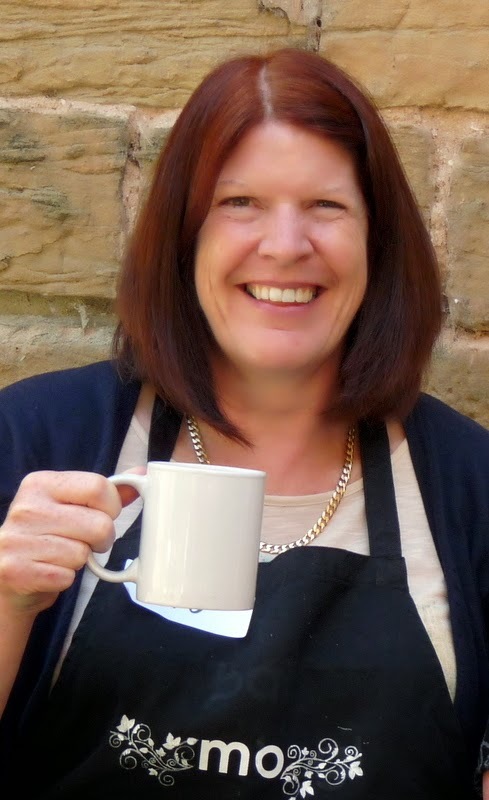 It has been such a pleasure to play a little part in such a fabulous Challenge blog. 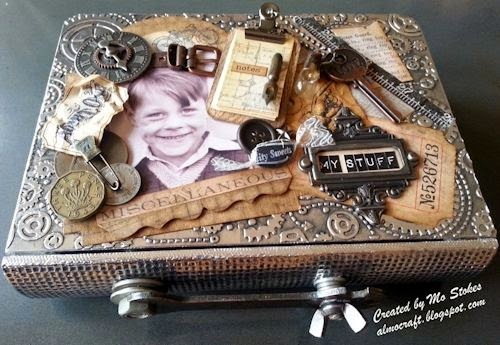 Congrats to all the winners - and WOW Mo - what a marvelous box you created for your husband - so many wonderful things to look at on it - and a lovely reason for each - I bet he loves this personalized creation from you - I hope he USES it and doesn't just pop all of his 'stuff' on top of it!! LOL!!! Thanks for all the details on how you created it! Congratulations to the worthy winners, I enjoyed looking at your entries there was so much detail. 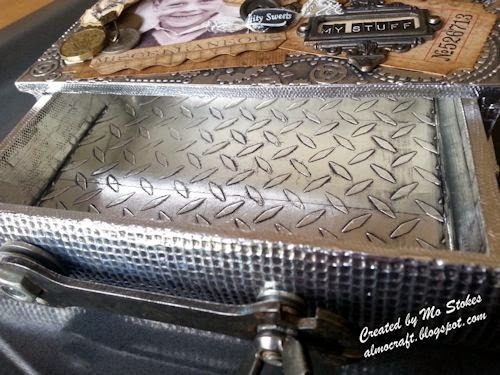 Mo I love the box, your husband must be thrilled to have so many memories in all the details. The handle is genius. I have so much to learn! Great project Mo. Thanks for sharing all the details! Congratulations Meggy May and thank you so much for giving me a pinworthy badge. Congratulations Yvonne and the 3 pinworthies, all brilliant creations. 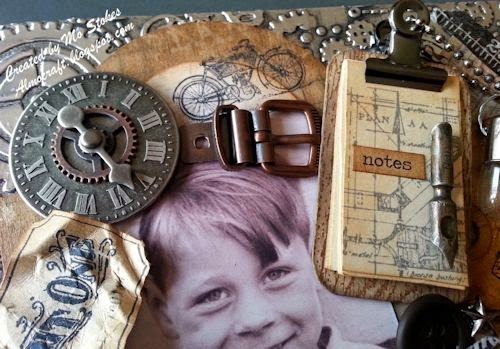 Mo, love the entire thing - your use of all the masculine elements is just fantastic! What a great use for a piece of art that can be enjoyed by both of you. Thanks for being our guest artist for this go round. Great job. Congrats to all the winners - A job well done!! Congrats on your Guest Spotlight! Fantastic inspiration!! A fabulous project, always inspiring to visit here.